According to the Mayo Clinic, sleep apnea is defined as a potentially serious sleep disorder in which breathing repeatedly stops and starts. You may have sleep apnea if you snore loudly and feel tired, even after a full night’s sleep. 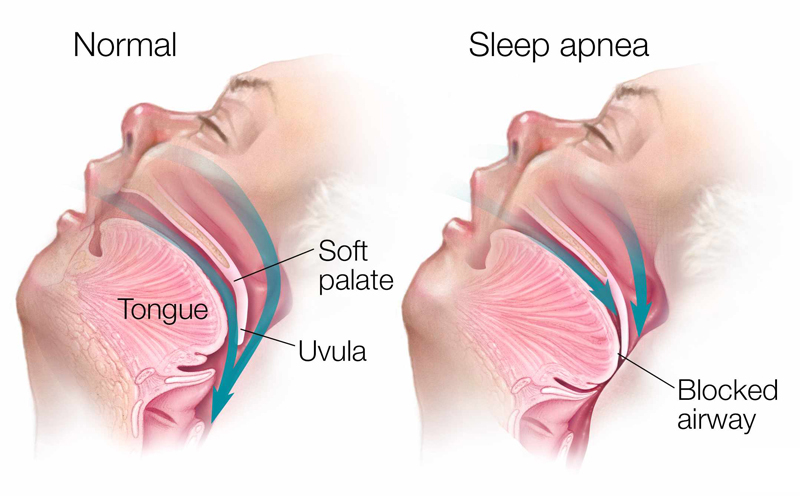 Obstructive sleep apnea, the more common form that occurs when an airway collapses. A person with obstructive sleep apnea may experience shallow breathing and possible pauses in breath, which may look disturbing. These breathing interruptions can last anywhere from a few seconds to a couple of minutes per breathing episode and these disturbances can cause an individual to have restless sleep and feel extremely fatigued during the day. Untreated sleep apnea increases the chance of heart attack, stroke, Type II diabetes, and even sudden death. Recent reports now even indicate a relationship between untreated sleep apnea and cancer, along with dementia, obesity and other health issues. Up to 20% of the US adult population has been estimated to be affected by sleep apnea and an even more alarming 90% of the population remains undiagnosed. Snoring is is no laughing matter. 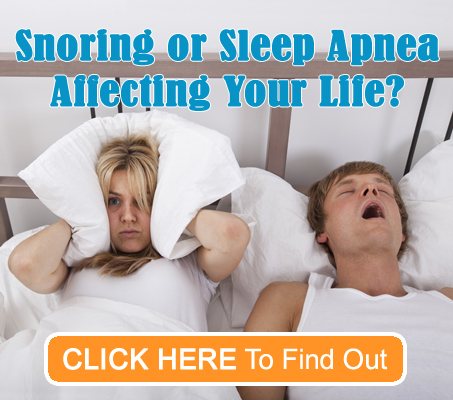 Since snoring may be an indicator of sleep apnea, it should be taken seriously. Testing and treatment are necessary to avoid heart problems and other complications. Additionally, there is a five times greater risk of dying from cancer when you have untreated sleep apnea. Once a patient has been diagnosed with obstructive sleep apnea, we create a custom oral appliance that supports the lower jaw and positions it forward which keeps the airway open during sleep. This appliance is similar to a mouth guard and is worn at night or anytime during sleep. This custom device, which is also known as a mandibular advancement device (MAD), is positioned in such a way that the mandible (lower jaw) is positioned forward slightly, just enough to keep the airway open for efficient breathing and to stop snoring. The doctors at Triangle Family Dentistry are specially trained in fabricating and fitting sleep appliances for our patients. We utilize a digital impression technique and order the custom appliance specific to your needs. The screenings are quick and reliable, and oral appliances are custom-made and adjusted to provide the exact position that is right for you and your unique situation. The oral appliance is soft on the inside, more durable and sturdy on the outside, and uses a BPA-free material. Obstructive sleep apnea and heavy snoring are much more than just an inconvenience; they are potentially life-threatening disorders and proper treatment is crucial for reducing the associated risks. If you think you might suffer from obstructive sleep apnea and would like to learn more, Contact Us today to schedule an appointment to speak with one of our specially trained doctors.